INDIA- The Seventh Largest Country in the World. Population wise they occupy the second position. There are several Ethnic issues, religious Fights, Caste divisions and Cultural Problems among the People in India. Despite all these differences, the People of INDIA unite together for one single reason- CRICKET. The Gentleman’s Game has been the Heart and Soul for majority of the People in the country. For many Indians, Cricket is a Religion. People rejoice when the team faces Success and has the Spirits high when the team loses. The fans wont let their Players down and keep on supporting them in their bad phase. Such is the Love between Cricket and its fans in India. 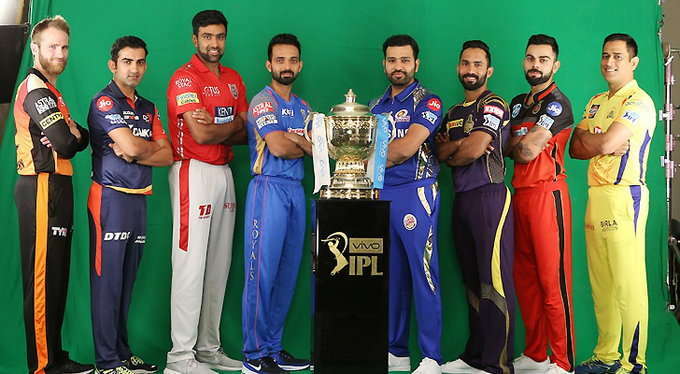 I, Vignesh Ananthasubramanian, an Avid Cricket Enthusiast from India have immense Privilege in bringing you the THE JOURNEY OF INDIAN CRICKET FROM GRODY TO GLORY. 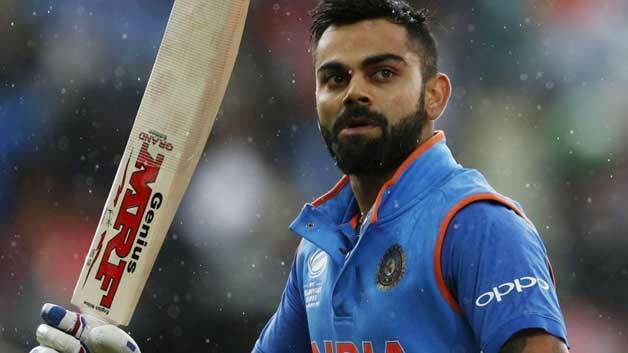 The Indian Cricket team, which is successful in the recent Past are not made in a Fort-Night. There is a rich haul history behind the team which takes us back to mid 20th Century. 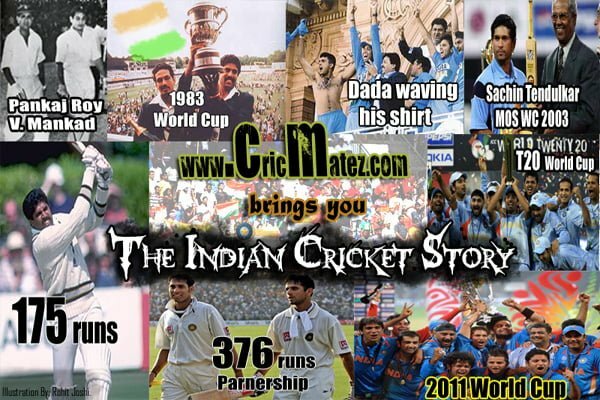 Let us take a look back at the Journey of Indian Cricket team from the root level. The exact date of Cricket’s inception in India is still enigmatical, due to lack of proper facts. 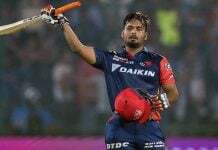 However, according to some people, the Indians started playing the game for the first time in year 1848 and according to few experts, Sepoy Cricket at Sylhet is the origin of Indian Cricket. The Game started spreading to all parts of the country in late 19th Century and early 20th Century. In 1912-13, the first Quadrangular series in Indian Cricket started. It was played between The Parsees, The Englishmen, The Hindus and the Muslims. In the Early 1900’s Two Indian Cricketers represented the England Team. They are Maharaja Ranjit Singh(the Ranji Trophy was named after him) and Duleep Singhji(the Duleep Trophy was named after him). Finally India got its first international assignment in the history of Indian Cricket came in the year 1926 in which the Marylebone Cricket Club(MCC) toured India for an unofficial Tour. It persuaded to the formation of the Board of Control for Cricket in India (BCCI) in the year 1928. India got the status of a Test Playing Nation in 1932, 15 years before they attained Independence. 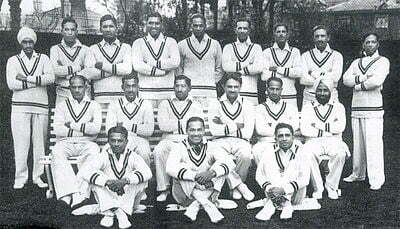 The First ever Test Match, The Indian Cricket played was way back in 1932 against England in Lords. 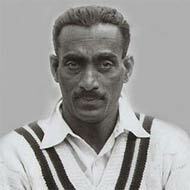 CK Nayudu led the First ever Indian Test Team. 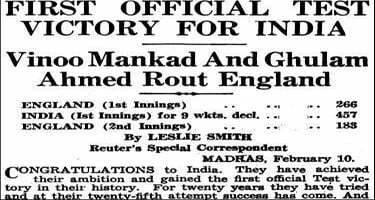 India’s first ever Test victory came against England at Madras in 1952. This Period in Indian Cricket started with some extraordinary performances from Players like Polly Umrigar, Subash Gupte. The series against Pakistan in 1952 goes down in Indian Cricket history as the Indian Cricket Team registered their First ever Test Series win. As the years went on, the Indian Cricket team became a force to reckon with in their home soil. 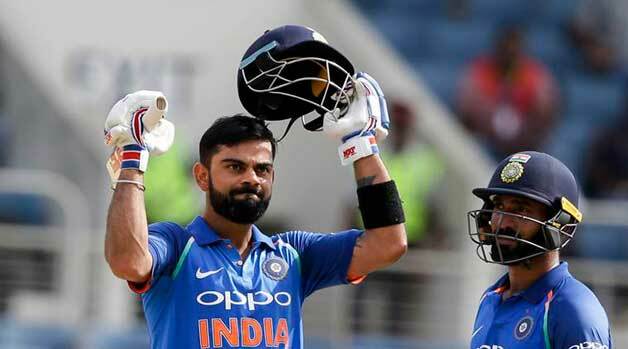 It was evident from the fact that India defeated New Zealand and held the teams like Pakistan, England and Australia to a draw at that time. The 1956 home series against New Zealand saw the First Record created by Indian Cricket team. Opening Batsmen Vinoo Mankad and Pankaj Roy stitched together a record Partnership of 413 runs for the Opening Wicket against the Kiwis in Madras which was unbroken for 52 years. 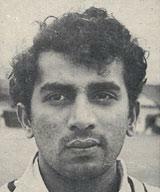 India’s Youngest ever Captain Mansoor Ali Khan Patudi aka Tiger Patudi made his debut in 1961. This Period in Indian Cricket produced some World-Class players like Farookh Engineer, Dilip Sardesai, Ajit Wadekar. 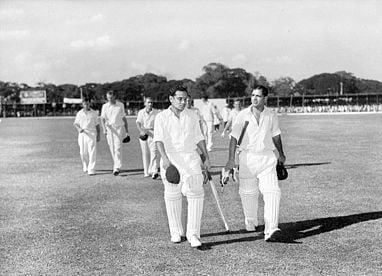 In this same period, India also won its first series outside the subcontinent, against New Zealand in 1967–68 under the Captaincy of Patudi. Slowly the Indian Cricket started to become a dominant force in World Cricket. It was a phase that turned the fortunes of Indian Cricket and how the game is played in India. The Dominance of Indian Cricket around the World began in this Period which is known as Golden Era of Indian Cricket. 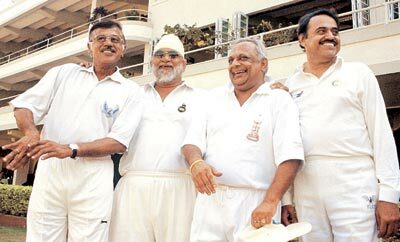 The Legendary Indian Spin Quartet From left: Venkataraghavan, Bedi, Chandrasekhar, Prasanna. This Period saw the emergence of Sunil Gavaskar, G.Viswanath, and the famous Spin Quartet which comprised E.A.S. Prasanna, S. Venkataraghavan, BS Chandrasekhar and BS Bedi. The Quartet was the Key to India’s Bowling in the 1970’s which gave nightmares for opposition batsmen and exploited the Spinner Friendly Conditions well. The biggest push for the Indian Cricket came in 1971 when the team led by Ajit Wadekar won back-to-back series in the West Indies and England. Indian Cricket Team had a disappointing Inaugural Cricket World Cup in 1975 and the Second edition in 1979. The team did not manage to qualify for the second round in both the times. Indians were known for their Defensive Batting approaches then which led to the poor performance in the World Cup. In between in 1976, India set a then test record against the West Indies at Port-of-Spain when they chased 403 courtesy a Brilliant 112 from Viswanath. As the Indian Cricket moved into 1980’s, the team opted for Attacking Batsmen and were answered with he likes of Kris Srikkanth, Mohinder Amarnath and Ravi Shastri. The biggest addition to the Squad was the Legendary All-Rounder Kapil Dev. Then came the moment that turned Indian Cricket on its head. 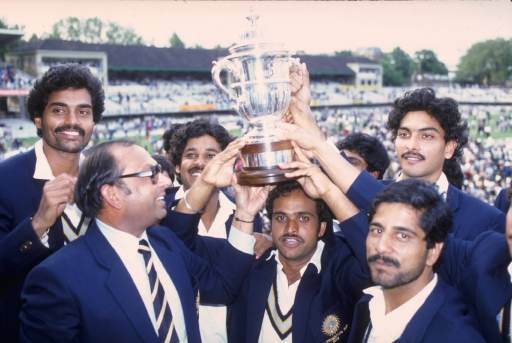 The Indian Cricket team led by Kapil Dev amazed the Cricket Fraternity by Winning the 1983 World Cup in England. Underdogs India defeated the Two-Time defending Champions and the favourites West Indies in the finals. Aftermath the World cup victory, Indian Cricket saw one of its Stylish batsman Mohammed Azharuddin breaking into the squad. In addition to the 1983 WC, India won the World Championship of Cricket in Australia in 1985. Soon Gavaskar made a Test record 34 centuries as he became the first man to reach the 10,000 run mark. Later Kapil Dev became the highest wicket taker in Test cricket with 434 wickets. Still, India remained a very weak team outside the Indian subcontinent. Another lowest point in the Golden era of Indian Cricket is the 1987 WC where India got Knocked out in the Semi-Finals. After the retirement of Sunil Gavaskar in 1987, Indian Cricket team had a tough job in finding his replacement. Replacing a man of his stature is a difficult thing. But the God’s own gift to Indian Cricket helped in solving the Problem. 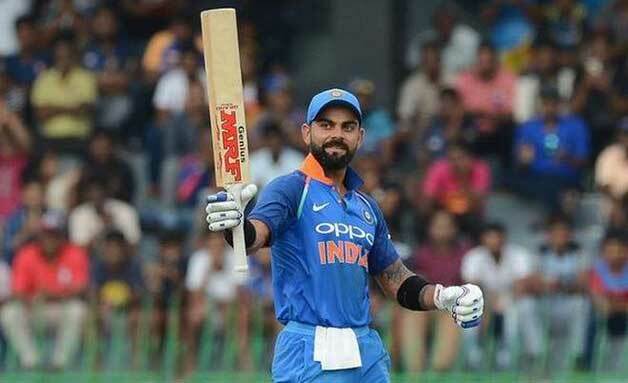 The Wonder Kid made his debut for the Indian Cricket team at a tender age of 16, the age at which normal Children will be busy completing their First Phase of Education. 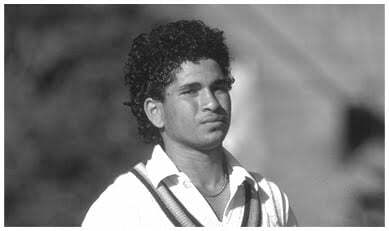 Sachin Ramesh Tendulkar made his debut against Pakistan in 1989 and the rest is History. In the following year, the Indian Cricket team saw the emergence of Anil Kumble, who went on to become the Third Highest Wicket taker in Test Cricket. Soon Sachin, Kumble were joined by India’s best Speedster till date, Javagal Srinath. The team had its ups and downs in the early 1990’s. India ended seventh on the table during the 1992 WC. Sachin, the Master Blaster began to take charge in ODI’s too. Sachin dominated the bowlers all over the World, Srinath used his pace to maximum effect and Kumble confused the opposition batsmen with his Leggies. These Youngsters were guided well by their Skipper Mohammed Azharuddin. The Indian Cricket team were Knocked out in the Semi-Finals of the 1996 WC by Sri Lanka. Later Vinod Kambli claimed that the match was fixed. The Indian Cricket underwent a massive transformation at that time. The Test Tour to England saw the arrival of The Prince of Calcutta( now Kolkata) Sourav Ganguly and one of the Greatest Batsman to have played the game Rahul Dravid. 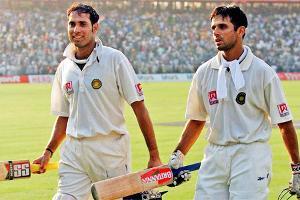 Both excelled in their debut with Ganguly went on to score a ton. Sachin was made the skipper and soon he stepped down as a result of a Slump in form. 1998 saw Sachin marauding the opposition bowlers time and time again. In February 1999, Kumble created history by picking up all the 10 wickets in an innings against Pakistan in New Delhi. 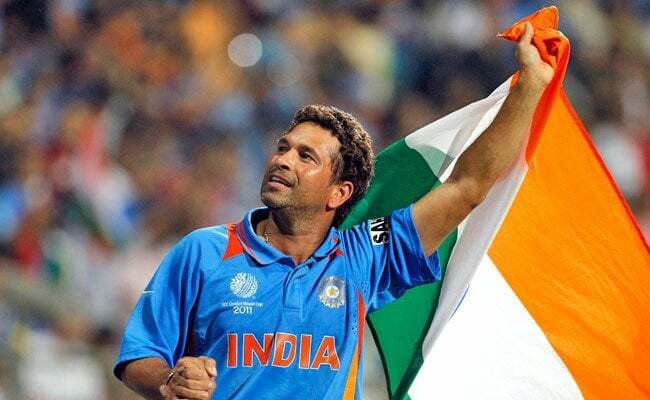 After a disastrous 1999 WC in England in which India failed to qualify for the semis, Sachin was made the captain again and had another poor run which saw India going down to the Aussies down under and the Proteas at home. Again Sachin resigned and vowed not to lead the Indian Cricket Team again. Sourav Ganguly appointed the new captain of the Indian Cricket Team. Then came the the “Indian Cricket’s worst hour“. Former Captain Mohammed Azharuddin and Ajay Jadeja were involved in a match-fixing scandal and given life and five years bans respectively. 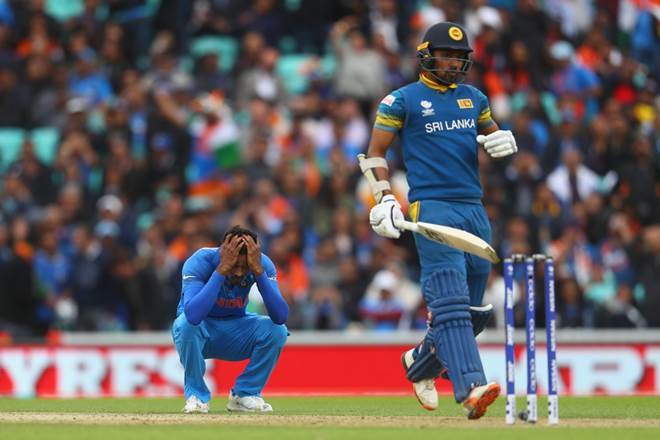 The nucleus of the team(Sachin Tendulkar, Rahul Dravid, Anil Kumble and Sourav Ganguly) promised not to let this happen again and led Indian Cricket out of the Blushes. 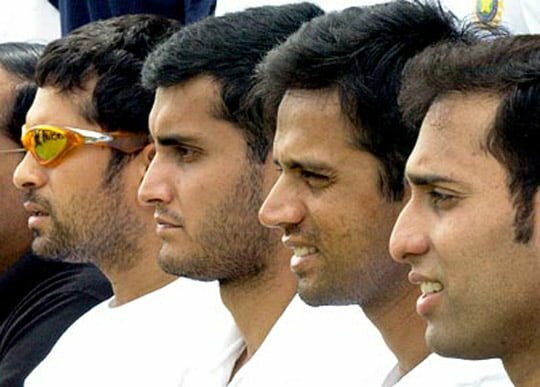 Burying their ego’s aside, Sachin, Kumble and Dravid supported Ganguly in leading the Indian Cricket into a new era. Soon VVS Laxman broke into the side and John Wright was made the coach of the Indian Cricket Team. The seniors along with John Wright made the Youngsters feel comfortable in the dressing room and extracted what they are capable of. Yuvraj Singh, Zaheer Khan, Mohammed Kaif, Harbhajan Singh and Virender Sehwag had their careers teed off in a great note. The 2001 series vs Australia made a huge impact in the Journey ahead for Indian Cricket. The Mighty Aussies led by Steve Waugh won the First test and equaled the record for being unbeaten in Tests for 15 matches on the trot. With Aussies’ streak on the line and India made to follow on in the second test at Kolkata, everyone thought its all over for the Indian Cricket team. But three men had other thoughts. VVS Laxman and Rahul Dravid helped India to get a lead of over 300 and Harbhajan’s late burst proved too costly for Australia as they were beaten by India. This match went into the History Books of Indian Cricket. In the third match at Chennai, The Aussies were beaten Fair and Square by India and lost the test series 1-2. Australian captain Steve Waugh labelled India as the “Final Frontier” as a result of his side’s inability to win a Test series in India. Victory in 2001 against the Australians marked the beginning of a dream run for Indian Cricket under Sourav Ganguly. The Indian Cricket team won Test matches in Zimbabwe, Sri Lanka, West Indies and England. The 2002 England series is also known for India’s highest ODI run-chase of 325 runs at Lord’s against England in the finals of Natwest Series. That match was better remembered by the fans for Ganguly waving his shirt in the air after winning the match as he took revenge for Flintoff’s actions in Mumbai. Later that year, Indian Cricket team were crowned Joint winners in the ICC Champions Trophy in Sri Lanka. Then came the 2003 World Cup in South Africa. Experts felt that the Indian Cricket Team wont reach the second round in the conditions that don’t suit them. Sourav Ganguly’s men thrashed each and every thing that came their way and reached the Finals where they lost to Australia. Some of the WC moments the Indian Cricket fans will cherish are Sachin’s Innings against Pakistan, Ashish Nehra’s Spell vs England and Ganguly’s Captain knock in the semis against Kenya. 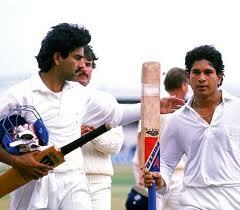 Sachin was adjudged Man of the World Cup. Later that year, the Indian Cricket team discovered a new Pace sensation, Irfan Pathan. The 2003–2004 season also saw the Indian Cricket Team play out a Test series in Australia where they drew 1–1 with world champions, and then win a Test and ODI series in Pakistan. The Test series against Pakistan goes down in Indian Cricket History as Virender Sehwag smashed a breath-taking 309 in Multan. It was the first time an Indian batsman went past the 300 mark in tests. The Majestic Era of Indian Cricket drew towards its end. At the end of the 2004, Indian Cricket suffered from lack of form and fitness from its older players. Greg Chappell took over from John Wright as the new coach of the Indian cricket team. Chappell was controversial in the beginning of his tenure. 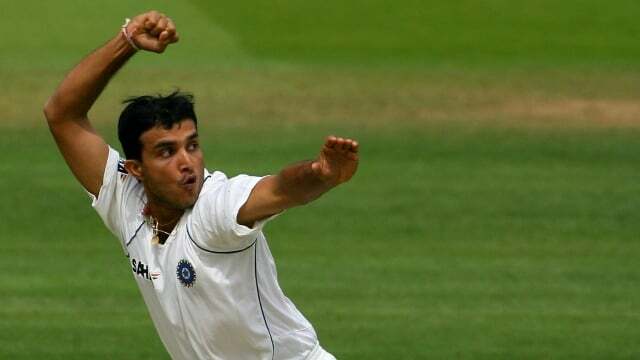 The tension resulted in a fallout between Chappell and Ganguly, resulting in Rahul Dravid being made captain of Indian Cricket Team. 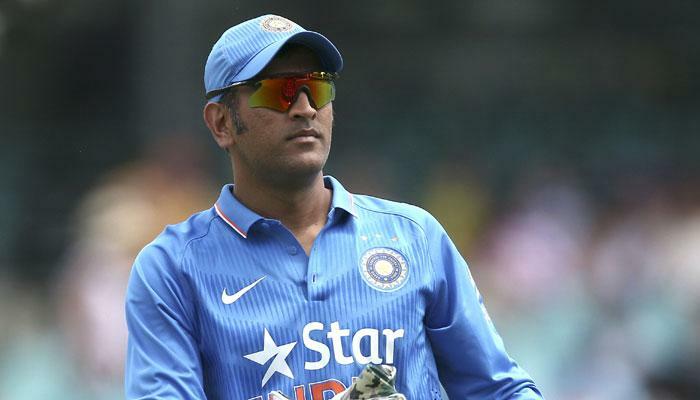 This triggered a minor revival in the fortunes of Indian Cricket, that saw the emergence of Mahendra Singh Dhoni. As the years passed by, many changes took place. Irfan Pathan lost his way in the middle and T20 cricket broke into the International Scene. Then came the 2007 WC in the Caribbean where the Indian Cricket team was shammed. The players were embarrassed by some of the fans and Greg Chappell was sacked as the Coach of Indian Cricket team. Greg Chappell was the first to fight for some Youngsters in the Indian Cricket team instead of Ageing Players. Many Criticized him. But to be honest, Chappell’s idea remained the backbone of the success of Indian Cricket in the future what we call as Glorious Era of Indian Cricket. Is the Future of INDIAN CRICKET safe? 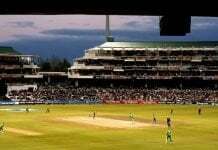 Next articleWhy India are favourites to win ICC Champions Trophy 2013?